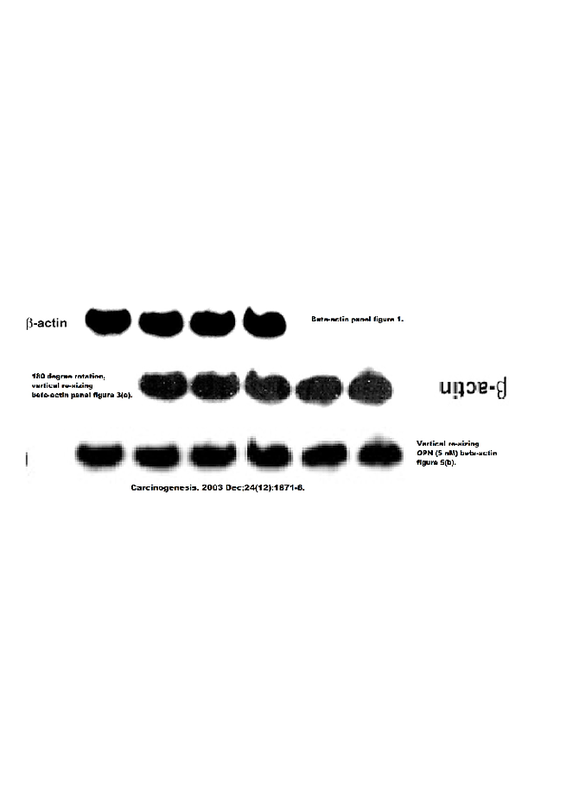 Biochemical Journal has pulled a 2006 paper for an undisclosed “background subtraction box” in an image – which, if you take a not-particularly-close look at the figure to the right, means somebody added a black rectangle over the control lane. It has been brought to our attention that Figure 1(A) contains a background subtraction box in the lane labelled ‘Control + IgG’. As this band represented an important negative control, this has serious potential to affect the conclusions drawn in the paper, and therefore we are retracting this paper. We thank the Editorial Board of the Biochemical Journal for pointing out this error. Lead author Paul Kuo was at Duke at the time; he is now chair of surgery at Loyola University. In IL-1β (interleukin 1β)-stimulated rat hepatocytes exposed to superoxide, we have previously identified an IRX (inflammatory redox)-sensitive DR1 [direct repeat of RG(G/T)TCA with one base spacing] cis-acting activator element (nt –1327 to –1315) in the iNOS (inducible nitric oxide synthase) promoter: AGGTCAGGGGACA. The corresponding transcription factor was identified to be HNF4α (hepatocyte nuclear factor-4α). HNF4α DNA binding activity and transactivation potential are tightly regulated by its state of phosphorylation. However, the functional consequences of IRX-mediated post-translational phosphorylation of HNF4α have not been well characterized. In the setting of IL-1β + H2 O2 , HNF4α functional activity is as- sociated with a unique serine/threonine phosphorylation pattern. This indicates that an IRX-sensitive serine/threonine kinase path- way targets HNF4α to augment hepatocyte iNOS transcription. In the present study, following identification of phosphorylated residues in HNF4α, serial mutations were performed to render the target residues phosphorylation-resistant. Electrophoretic mobi- lity-shift assays and transient transfection studies utilizing the iNOS promoter showed that the S158A mutation ablates IRX- mediated HNF4α DNA binding and transactivation. Gain-of- function mutation with the S158D phosphomimetic HNF4α vec- tor supports a critical role for Ser158 phosphorylation. In vitro phosphorylation and kinase inhibitor studies implicate p38 kinase activity. Our results indicate that p38 kinase-mediated Ser158 phos- phorylation is essential for augmentation of the DNA binding and transactivation potential of HNF4α in the presence of IL- 1β + H2 O2 . This pathway results in enhanced iNOS expression in hepatocytes exposed to pro-inflammatory cytokines and oxidative stress. The paper has been cited 22 times, according to Google Scholar. We’ve reached out to Kuo and the editor, and will update with any new information we get. Update, 5/19/16, 4:11 p.m. Eastern: We have posted an update to this story. Update, 5/20/16, 3:45 p.m Eastern: Based on new developments in this story, we have changed the headline to better reflect the narrative. Alas, you are probably right. Anyway, we should probably call this a “foreground subtraction box”. Comments on 4 other papers by the same senior author were posted at Pubpeer on 16th February 2014. Were all the reviewers and the editor on acid? No one managed to spot that the most important band lane was simply copypasted within a pitch dark rectangle? Ann Surg. 2012 Feb;255(2):319-25. doi: 10.1097/SLA.0b013e31823e3a1c. Bhattacharya SD, Mi Z, Kim VM, Guo H, Talbot LJ, Kuo PC. Figure 1. Please compare signal lane marked as 6 with Non-Metastatic Tenascin-c panel with darker version lane marked as 4 Metastatic SMA panel. Please compare lanes marked as 7 and 8 Non-Metastatic Tenascin-c panel with darker version lanes marked as 5 and 6 Non-Metastatic SMA panel. Metatstatic SMA panel. Vertical, straight changes background between lanes 2,3 and 4. Non-Metastatic SMA panel. Vertical, straight changes background between lanes marked as 6,7 and 8. Surgery. 2008 Aug;144(2):182-8. doi: 10.1016/j.surg.2008.03.007. Epub 2008 May 16. 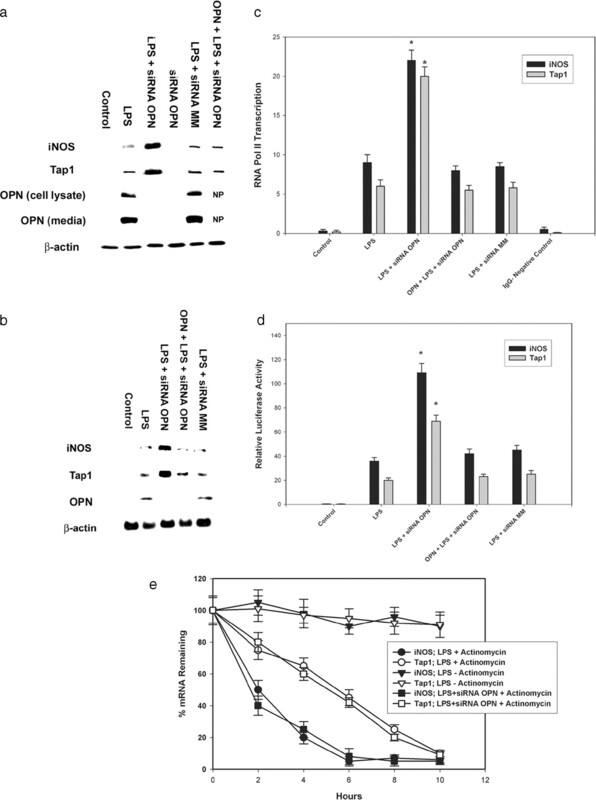 Osteopontin mediates Stat1 degradation to inhibit iNOS transcription in a cecal ligation and puncture model of sepsis. Guo H1, Wai PY, Mi Z, Gao C, Zhang J, Kuo PC. 1Department of Surgery, Duke University Medical Center, Durham, NC, USA. Please compare right CLP 12 h OPN (-/-) P-Stat1 band with left CLP 12 h WT P-Stat1 band. Cancer Res. 2007 May 1;67(9):4088-97. Mi Z, Oliver T, Guo H, Gao C, Kuo PC. Figure 5C. Lower cell lysate beta-actin panel. Please compare bands lanes 1 and 8. 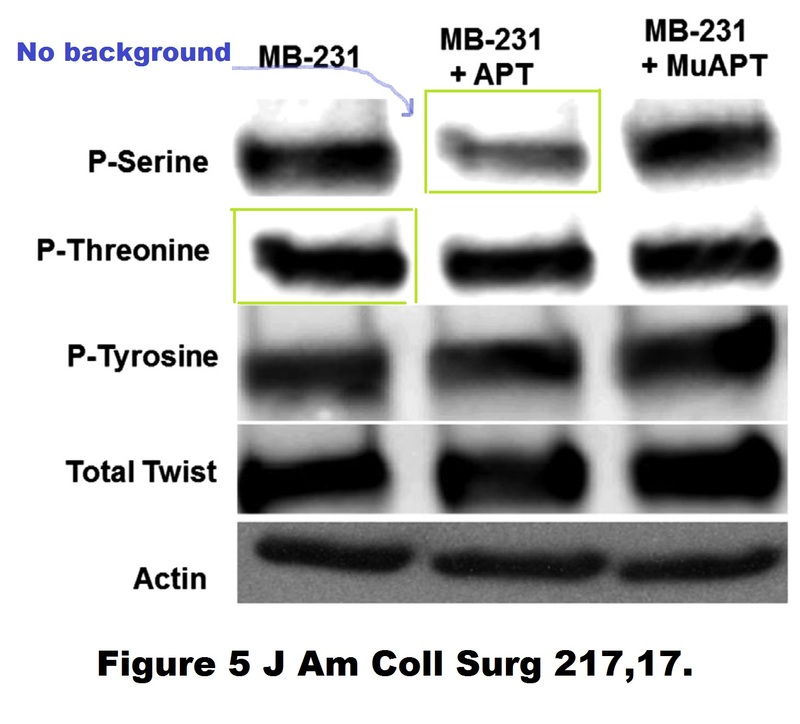 Bands lanes 1 and 8 cell lysate Pro-MMP2 panel are different. Figure 5C. Medium Pro-MMP2/Active-MMP2 panel. Please compare Pro-MMP2 bands lanes 1 and 8. Active-MMP2 bands are different. If you take a close look at the representative in vivo images, you can see that the scale bars display different upper and lower thresholds, though it impossible to read the actual numbers. If you magnify that image and look at the fringe of the black box, you will see a fairly faint “white halo” around most of the box, which indicates that the authors manipulated the lane to conceal a positive band and to make it appear as a negative one. In other words, the authors had a positive result, but made it look negative, i.e., manipulation. Automatically, that means all results are valid. The authors hould now be forced (by the publisher?) to contact the 22 journals that cited their paper and request an erratum. I think this should be the new norm in science publishing related to retractions. If however, the publisher is responsible for the errors that lead to a retraction, then it should be the publisher that should then contact the journals or books that have cited the retracted paper. Erratum: “that all results are valid” should read “that all results are invalid”. J Immunol. 2007 Feb 1;178(3):1870-81. Gao C1, Guo H, Mi Z, Grusby MJ, Kuo PC. This work was supported by National Institutes of Health Grants R01-GM65113 and R01-AI44629 (to P.C.K.) and R01-AI506296 (to M.J.G.). Figure 2b. iNOS panel. Please compare band LPS lane with band LPS+siRNA MM lane. 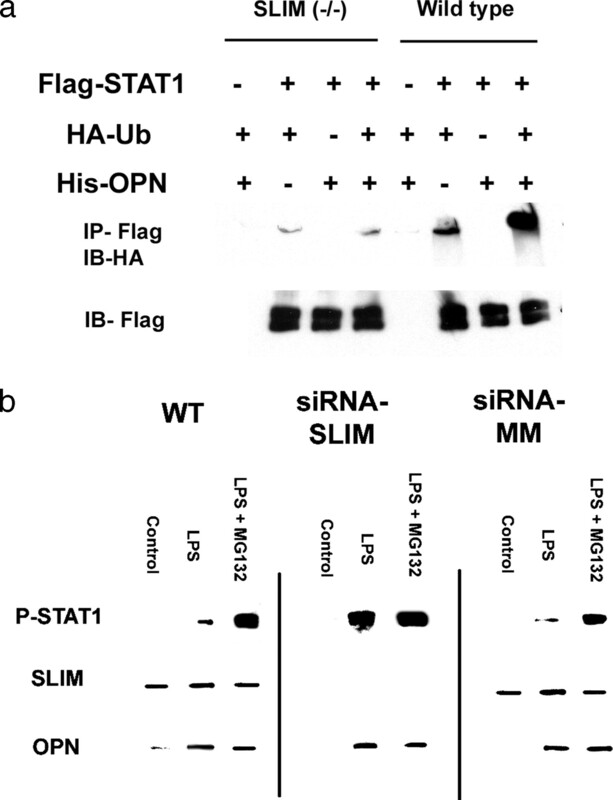 Please compare Control band siRNA MM SLIM panel with LPS+MG132 band WT SLIM panel. Please compare LPS+MG132 band siRNA MM OPN panel with LPS band WT SLIM panel. 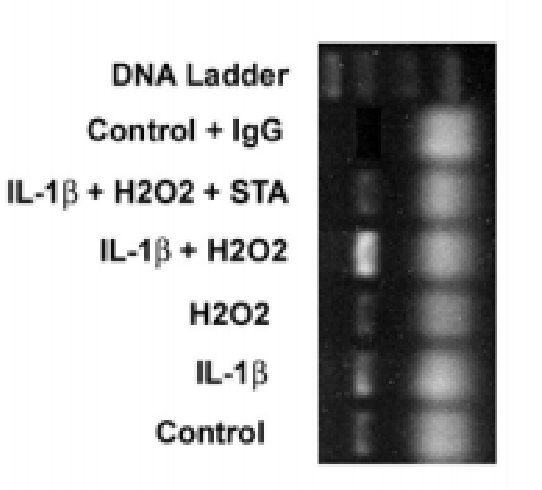 Please compare Control WT SLIM band with LPS+MG132 band siRNA MM SLIM panel and with LPS+MG132 band WT OPN panel. The citation count is reported from Google Scholar, while in previous articles it was obtained from Thomson Reuters Web of Science. Does anybody know why that is? Thanks for the query. We’ve been having some technical difficulties with our usual Web of Knowledge access. We’ve asked the relevant people to look into it. Am J Physiol Cell Physiol. 2003 Apr;284(4):C1090-9. Epub 2002 Dec 4. Guo H1, Wei J, Inoue Y, Gonzalez FJ, Kuo PC. 1Duke University Medical Center, Durham, North Carolina 27710, USA. This work was supported by National Institutes of Health Grants AI-44629 and GM-65113 (to P. C. Kuo) and the American College of Surgeons Clowes Development Award (to P. C. Kuo). Please compare signal right panel with horizontal mirror image signal right 2 lanes left panel. Figure 6. Vertical, straight, grey streaks/ vertical change background between lanes 3 and 4. There are only 4 lanes. Carcinogenesis. 2003 Dec;24(12):1871-8. Epub 2003 Aug 29. Gao C1, Guo H, Downey L, Marroquin C, Wei J, Kuo PC. J Biol Chem. 2002 Feb 15;277(7):5054-60. Epub 2001 Dec 6. Hepatocyte nuclear factor-4alpha mediates redox sensitivity of inducible nitric-oxide synthase gene transcription. Guo H1, Cai CQ, Kuo PC. Please compare lane 2 and 3 of Fig1. with lane 1 and 2 of Fig3. What is your opinion? This paper has not been commented on pubpeer! They’re identical with contrast changed. I think Fig 1 is the original. In Fig 3, the two bands look out of place and there’s a vertical background change to the right of them (at the bottom). Thanks, that was my impression as well. However, now that I wanted to take a second look at these figures I can no longer see to the images “403 Forbidden” though the text is accesible. Is it only me? Same problem. It might be a temporary technical issue so worth checking again in a few days. I can’t access the images, and the PDF is also down. Can this be a coincidence? Maybe. Ah, it’s affecting other papers as well. Not just this one. It seems that it was only temporary. An additional observation: please compare band lane 2 of Fig3 with lane 6 of Fig4 (especially after horizontal flipping and enhancing the contrast in Fig3) and lane 1 of Fig3 with lane 7 of Fig4. 2nd and last authors also on this 2015 retraction. J Am Coll Surg. 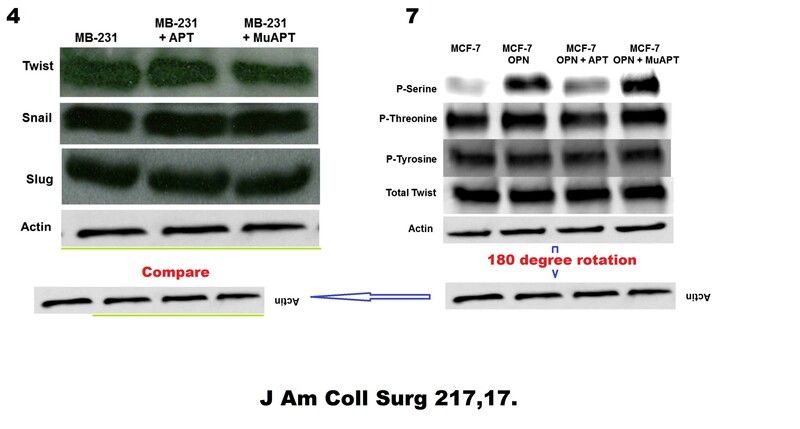 2013 Jul;217(1):17-26; discussion 26. doi: 10.1016/j.jamcollsurg.2013.02.025. Epub 2013 Apr 23. Osteopontin up-regulates critical epithelial-mesenchymal transition transcription factors to induce an aggressive breast cancer phenotype. Li NY1, Weber CE, Mi Z, Wai PY, Cuevas BD, Kuo PC. 1Department of Surgery, Loyola University, Maywood, IL 60153, USA. J Am Coll Surg. 2015 Aug;221(2):642.